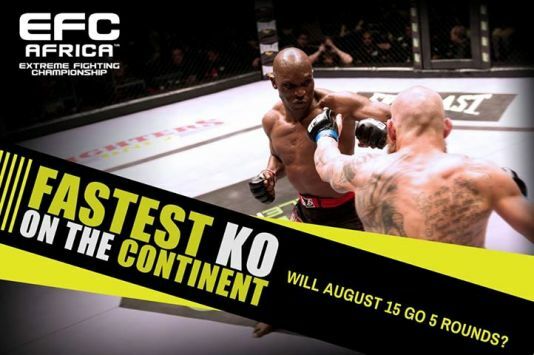 EFC AFRICA has emerged as a significant part of the South African combat sports fibre. The growth of EFC as a quality platform for mixed martial arts has seen the emergence of world class fighters on our own shores. Names like JP Joubert, Don Madge, Ruan Potts and others have become household names. Tonight is EFC AFRICA 22, the latest and biggest in the ever-growing series, hosted at Carnival City on the East Rand. And tonight will see arguably one of the most exciting bouts to take place in EFC’s history to date, the middleweight fight between JP “Tinkerbell” Kruger and Tumelo Maphuto. Kruger has four straight wins in the Hexagon. After his massive victory over Donavin Hawkey Kruger’s fans have been calling for a shot at Jeremy Smith for the middleweight title. Maphutha, a renowned knockout specialist, owns the record for the fastest KO in African MMA history. ‘Soldierboy’ wouldn’t stand with him and he claims that no one else will either. At EFC AFRICA 22, will this be Kruger’s last fight before he reaches EFC AFRICA gold, or will Maphutha call a halt to his climb to the top? Watch both athletes’ rise to this unforgettable match-up?